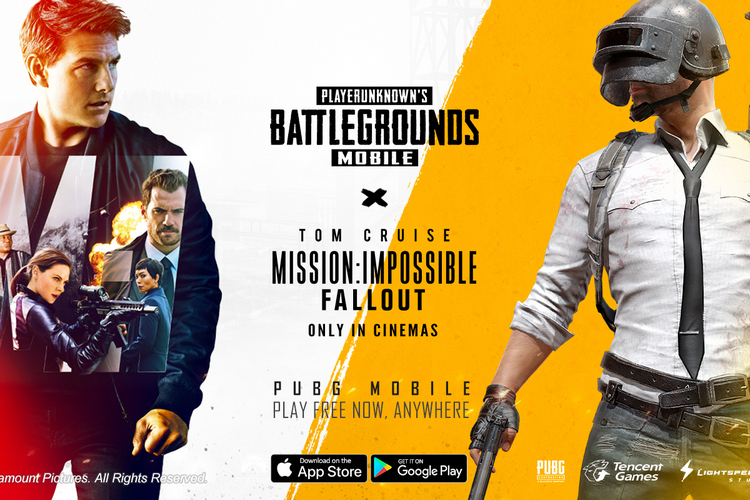 As part of a tie-up between PUBG Corp and Paramount Pictures, PUBG Mobile, will get a new theme based on Tom Cruise’s ‘Mission: Impossible – Fallout’ that was released in theaters last week. The deal, said to be the game’s first major brand partnership on mobile, will bring an all-new Battle Royale mission that is based on the movie. The new content is being rolled out as part of an incoming update. According to an official press release, the new in-game content includes a Mission: Impossible – Fallout takeover, where players can get new background music and customizable parachutes themed to the film. It also comes with special in-game rewards that will let players exchange themed items for Mission: Impossible – Fallout outfits to use during the promotional campaign. There will also be themed challenges that will let players compete for Team Rush, Survival and First-Person Perspective modes to earn various rewards. Players will also apparently be able to experience the world of Mission: Impossible – Fallout on their Android and iOS devices in PUBG Mobile with new items, challenges and other recognizable content straight from the film, according to the release. In a press statement, PUBG Mobile team general manager, Vincent Wang, said, “Nothing is impossible for PUBG Mobile, the world’s most popular mobile battle royale game — not even a partnership with an iconic movie franchise such as Mission: Impossible. After only a few months on the market, we continue to build our player base for PUBG Mobile while growing our brand with innovative partnerships such as this special in-game event to appeal to a broad range of gamers worldwide”.